Is it time to turf grassy front lawns in the Okanagan? This summer has brought home a number of home truths when it comes to the environment in British Columbia, chief among them our consumption of water. Western Canada is facing severe drought conditions with some municipalities and districts declaring water restrictions and even states of emergency. As things heat up, outside watering has become one of the biggest targets for calls of conservation and reform. 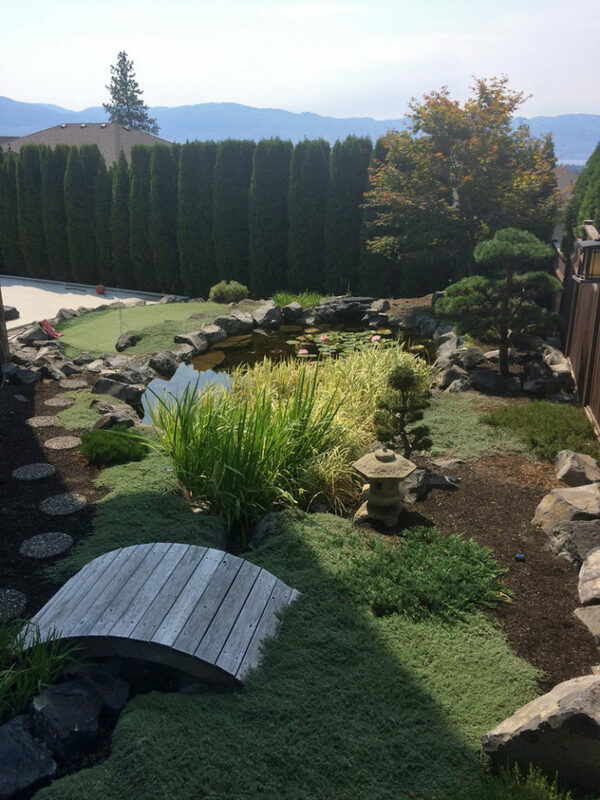 Lawns are one of the biggest reasons for outdoor watering as most need to be watered every other day if they are to stay green in the hot Okanagan sun. The Rutland Waterworks District has already had water restrictions in place for more than 40 years. Within that district, homeowners are only allowed to water their lawns every second day, based on an odd-even number system. 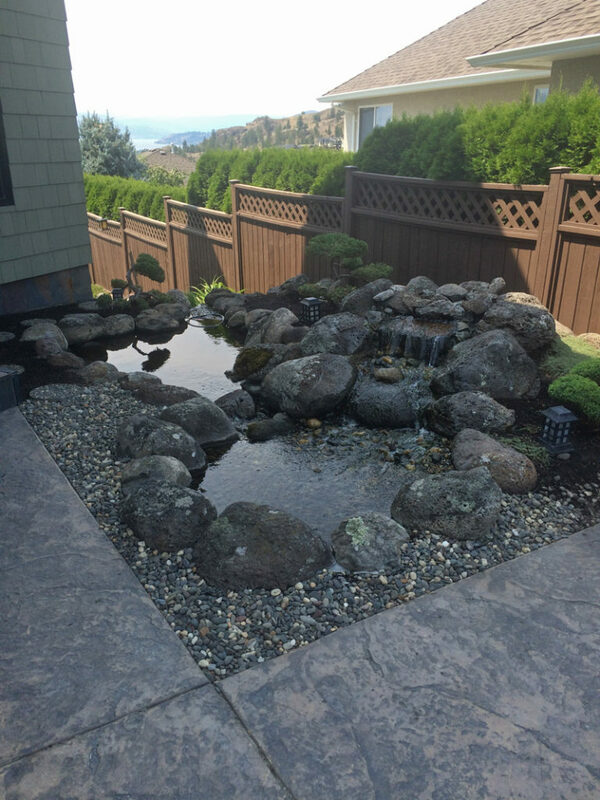 The natural slopes of hillside Okanagan homes offer a great place to create your own waterfall! California has been battling drought conditions for four years and watering of grass and lawns is no longer permitted. The American state has ordered cities and towns to cut back their water usage by 25% and changes in legislation will limit the traditional lawn. Starting in December, new residential landscaping restrictions will limit Californians in the amount of water-thirsty turfgrass and plants that can be included in the design. Heavy water-using plants cannot comprise more than 25 percent of the landscape for yards of 500 square feet or more. Yards of 2,500 square feet or more that require a permit, plan check or design review for renovations cannot include more than 25% turf or water-thirsty plants. Landscape designs of less than 2,500 square feet undergoing renovations will be able to comply via a prescriptive checklist. These restrictions and changes have prompted the creation of new businesses that paint your brown grass green, giving you the appearance of a lush, healthy lawn! Artificial turf makes a perfect putting green beside our tranquil pond. Kelowna is fortunate to be able to draw on several sources of water for residential, commercial and agricultural use. The City of Kelowna and Glenmore Ellison access their water from the lake and deep water wells. Glenmore Ellison also draws water from upland lakes, as does South East Kelowna and Black Mountain. Rutland Waterworks is the only district in Kelowna that pulls all of their water from deep well ground water systems. All of these water sources come with a variety of treatment needs and costs; costs to pump, build infrastructure for new developments, repair and replace older systems, power, human resources, and treatments needed to meet Canadian Drinking Water Guidelines. One thing is absolutely certain – water will continue to be a hot topic and will increase in price. So where does this leave you and the kingdom you call home? Everyone wants a beautiful yard and for many it is a point of pride and represents the hard work put into building your home. On the other hand, you want to be conscious of expense and would like to be regarded as a steward of this beautiful valley and the generations to come. 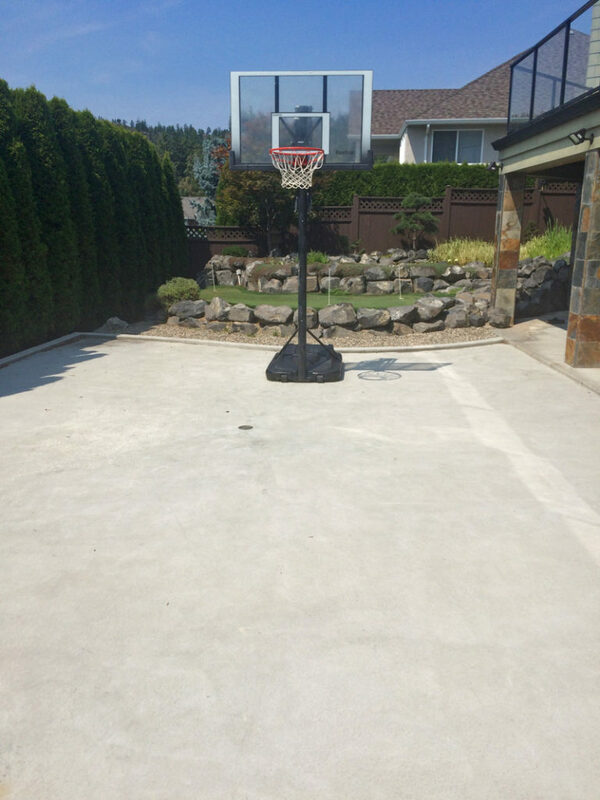 A concrete pad makes a great basketball court and means I don’t have to mow the lawn! For many, the compromise may be found in the front yard; those patches of lawn that are rarely used and serve purely ornamental purposes. My own home doesn’t have any lawn at all, so we are not only saving water, but I also don’t need to mow the lawn or weed in my spare time. Not having a lawn also means that we are reducing noise pollution caused by lawn mowers and saving our neighbours the 7 AM weekend wake-up calls. 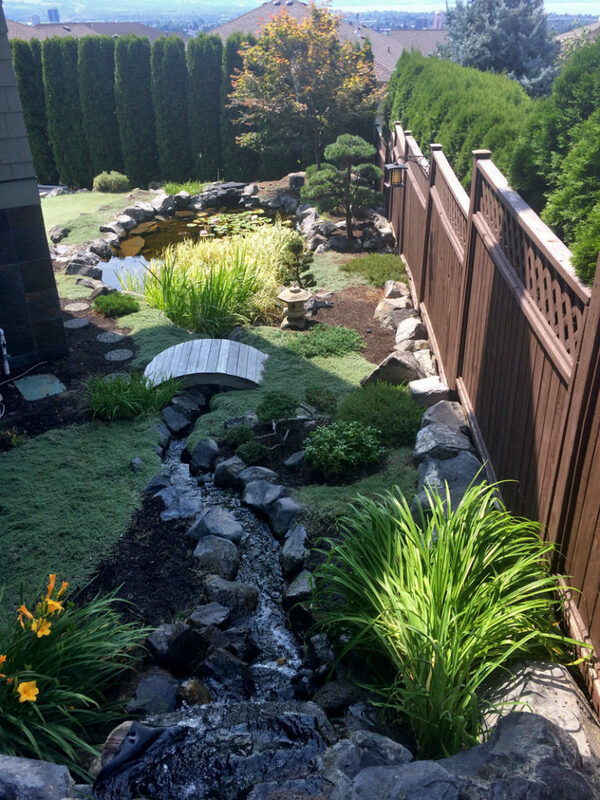 If you are building a new home, you may want consider embracing a xeriscape landscape design. 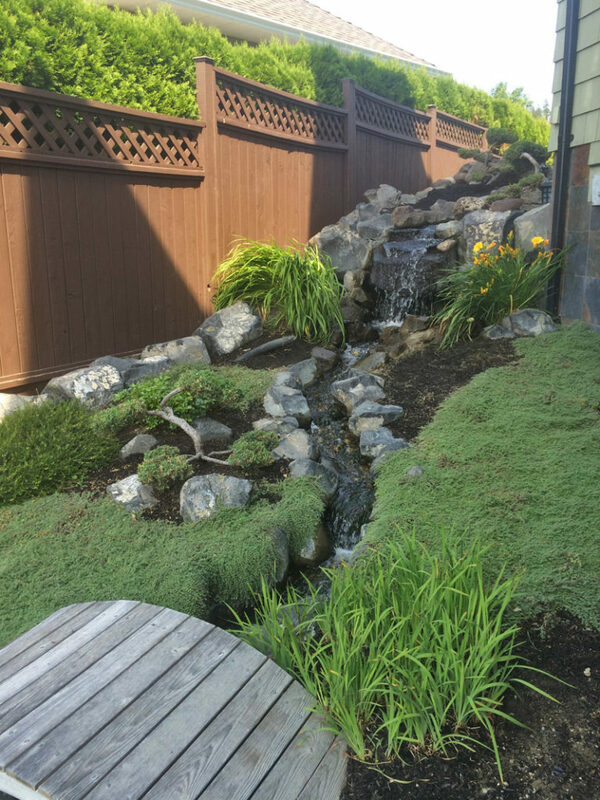 Xeriscape is a landscaping principle that utilizes low-water plants, reduced turf and efficient irrigation systems. Not only does this reduce financial costs by reducing water usage, the native and low-water usage plants used in these designs are beautiful. With the right planning, creativity and plant choices, nearly any style of garden can be created in a xeriscape design. Drought tolerant ground cover plants create the look of grass without the water and mowing. If you’re a parent, consider whether there is a nearby park that can facilitate childhood games and sports, or whether you need a patch of grass for them to play on at home. If you do need turf for your yard, consider using a more drought tolerant lawn seed and only place grass in areas where the children will be playing. If you are a current homeowner, consider removing your front lawn altogether, replacing the grass with rock, xeriscape plantings, or a combination of. There are far more options for drought-tolerant landscaping than you think and the front lawn is probably not where you send the kids to play anyway. California has enacted laws to help protect its ever-decreasing supply of water, but we don’t have to wait for our governments to do the same. Rethink that large grassy patch in your front yard and those flowers that require excessive watering day after day. The cost of these purely ornamental landscaping choices is growing greater and greater.